Have you noticed Metro’s realtime transit updates on Google Maps? Google soft-launched the new feature last week. If you’re using Google Maps on your smartphone, here’s how it works. After you open the app and it finds your location, tap on the transit icons on the map to see which lines use that stop or station. You should then see a screen like the one below. In this case, the times that are colored green indicate that a bus is arriving on schedule. The times in red indicate a bus that has fallen behind schedule. The times in black are the scheduled arrival times but with no real-time prediction yet. This new feature is a mashup of Metro’s planned schedules and the Nextrip realtime arrival data, which Metro began using in 2009. 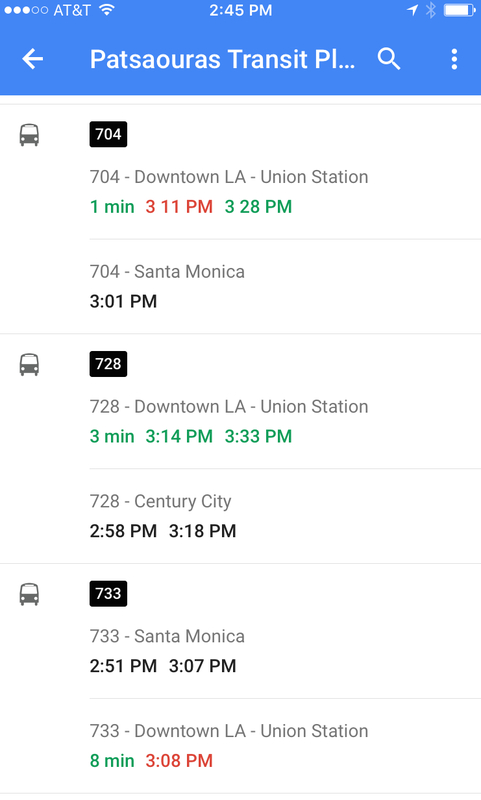 Embedding the real-time data in Google Maps means that users don’t then have to also visit the Nextbus website to see if their bus or train is on time. As Matt Wong, Strategic Partner Development Manager at Google said last week, “We prefer to launch real-time data as soon as is feasible and then iterate towards a better product as we receive user feedback on issues that may be present. What do you think? Is this new feature helpful? In Japan, they have had for the past 20 years, these bus stop signs that tell you everything with scrolling LED letters and voice prompts. A lot more outreach to provide arrival and heading info to all riders, including those who don’t have smartphones. “Embedding the real-time data in Google Maps means that users don’t then have to also visit the Nextbus website to see if their bus or train is on time.” Silly goose, you never visit the Nextbus website. You just use Transit, Citymapper, or Moovit apps all of which have displayed RT data for a long time! Cool. I remember back in June when I flew into LAX late at night, I found it useful to see when the last few buses up Lincoln were due to stop nearby. I’d imagine the realtime thing would be handy for lines running less frequent schedules, when the expected wait time is more than just a few minutes. Do you guys have realtime arrival info on the LCD displays at rail stations yet? LA is a complete amateur compared to bus stop signs and information in Korea. This could be helpful. Is this just the standard Google Maps app? Does it work on older Mac iOs systems? Yes, it’s the standard map. Not sure if works older but suspect it should. This was my complaint with google maps earlier, so I’m glad they are listening and making a distinction between nextbus enabled (la metro) vs non such as Santa Monica big blue bus. If you’re trying to time your bus rides, SM bbb ends up being a big gamble. They are notorious for not keeping their time table especially during rush hour. The driver must get their break and to hell with the time table. If it’s rush hour, then the likely culprit is the street traffic that is causing the bus delays. Buses drive in the same streets as other cars do and buses can’t magically pop up at the next bus stop by following the set time table. If you absolutely need to have a vehicle show up at the right time, then the best alternative to that is Uber or Lyft. And you’ll definitely pay more than the public bus for that service, but at least it’s far more reliable. Pay more for better service with competition between two service providers, it’s called the free market and capitalism. Pay more for crappier service (i.e. higher Metro fares in exchange for bus service cuts) is usually what happens when you let government handle things. As for drivers getting their union mandated breaks, that’s your voting pattern issue. You vote for Democrats who pander to public sector labor unions, that’s what you get. Don’t like the idea of public sector unions, vote Republican. If you don’t like Republicans (especially since Trump isn’t really helping the GOP’s image), then vote Libertarian. About driver breaks: In, most jobs you can get up and stretch occasionally, and taking rest room breaks isn’t an issue. For the drivers, those breaks aren’t a luxury. They are actually essential for safety, and designing routes so that the breaks are long enough to recover from normal traffic and still give the driver time for bodily functions is one of the more difficult tricks of transit network design. A timetable should reflect breaks and traffic conditions for that part of the day. i don’t know about all the internals… I just know it is bad outcomes for the riders when the buses are not spaced apart evenly and you don’t have real time arrival info. What exactly is your need to know how long the bus is laying over? It does give the operators a break if they ar on time but time is allowed as “recovery time.” Schedules can only reflect normal operating conditions. Road work, traffic accidents, detours for special events, etc. are impossible to be taken into account. I don’t need to know how long driver breaks are. I just need time between buses to be accurate if there is a timetable. if not by timetable time, at least expected intervals such as every 10 minutes. If I miss an express big blue bus, I might have to wait another 30 minutes even though the timetable intervals are shorter. Government has no obligation to do what you are asking and government has no obligation to help you. If you don’t like how Metro is operating, it’s up to you to vote in a person that will get the job done or find an alternate way to get around. The private sector, notably Uber and Lyft, are able to give you what you asking for without long waits. It’s just the matter of paying for the service which is obviously, more expensive than government run public transit services. You can’t have “I want excellent public transit services that will come when I want it and I want all of it for cheap.” You want what you asking for, download an Uber app but it’s going to cost you. But at least you’re paying for better service, not paying more for crappier service like Metro.